HUNDREDS OF THOUSANDS of people practice Wicca or neo-Pagan witchcraft in America today--as a journalist Catherine Edwards Sanders wanted to understand why such belief systems are attracting followers. When a routine magazine assignment led her to realize that her stereotypes of Wiccans was misinformed, her curiosity propelled her forward. 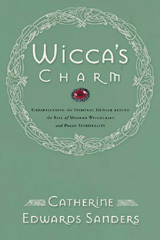 Wicca's Charm: Understanding the Spiritual Hunger Behind the Rise of Modern Witchcraft and Pagan Spirituality (WaterBrook Press/ Shaw Books September 2005) explains the powerful attraction of an increasingly mainstream alternative spirituality. During a year of criss-crossing the country, Sanders interviewed neo-Pagans and witches and found that the lure of this emerging spirituality was not necessarily the occult, but rather the search for meaning in a fragmented and materialistic culture. With keen observation, challenging insight, and compassionate critique, Sanders produces a lively narrative about what she experienced and discovered during her travels: Halloween rituals in Salem, anti-globalization protests in New York, the contrasts between what seekers find in neo-Paganism that they perceive lacking in the Christian tradition, and Wicca's tug on today's teenagers. She explores why churches often fail to engage the spiritual hunger of many who seek a holistic and authentic worship experience, and she offers spiritual insight and practical help to draw people towards the truth of Christianity. Webmaster's Review: The rise of Wicca and Neo-Paganism is at the heart of the argument for many Harry Potter critics, but I wonder how many of them actually talk and interact with Wiccans. Catherine Edwards Sanders did. Wicca's Charm only spends about two pages on the topic of Harry Potter but presents a realistic and balanced view of the books' influence. It's really hard to throw enough praises onto this book. Sanders never loses sight of the gospel but follows the examples of Paul and Christ to try to understand Wiccans and Neo-pagans. Sanders never calls witchcraft itself good, but she recognizes the same spiritual yearnings that drive people to Wicca are human and understandable and can be used to draw them to God. The book touches on the personal, social, historical, and spiritual forces at work. While acknowledging that real witchcraft can get into some scary territory, the tone of this book is not fearful but hopeful and loving. The book challenges Christians as individuals and in the body of the Church to consider how we treat those who are different from us and whether that attitude truly reflects the attitude of Christ. It also challenges Wiccans to take a second look at gospel of Christ, which both Sanders and I believe holds what they are truly seeking. Even if you don't have much interest in Wicca, this is a great book to read as a frustrated Christian, as a woman, as someone who wants to be a good steward of God's creation, or as someone seeking the spiritual reality of their faith. If Wicca's Charm only whets your curiosity, the book ends with notes, a glossary of terms, and a list of further reading material. My interest in Celtic Christianity and a holistic approach is certainly peaked. I think it's important to note that while Sanders interacted with Wiccans and observed some of their rituals, she never participated herself. This is important, because it is a line as Christians that we should never cross. These are in some ways small points, but I felt I needed to mention them. "Without their faith, he could not heal." This isn't the first time I've seen this concept. I remember cringing through the animated film "Prince of Egypt" (1998) when they sang "There can be miracles when you believe." Faith is powerful and important, yes. But God (and therefore Christ) is prefectly capable of working miracles without your permission. God can touch you even when your faith is tapped out and your hope is gone. He can restore these things to you. God laid the foundations of the earth, set in motion the clock work of the cosmos, and created DNA structure all before the first human was around to believe in Him. He loves us, but He is not dependent on us. Jesus was always the teacher. His miracles were done both to encourage faith and establish His connection with divinity, but also to act as an example. Jesus was fully capable of healing the men without their faith, but what would be the point of physically healing them if their souls were neglected? Ultimately this is the only place in the book where I took major exception, most of the time I was nodding vigorously. My second point is not really an exception so much as addendum. At the front of the Appendix, Sanders mentions L. Frank Baum, author of The Wizard of Oz series and how he presented women in his idealistic world of Oz as being the source of power and men as weak. (The Wizard was a fraud, the Scarecrow brainless, the Tin Man heartless, the Lion cowardly...) While this is the state of things in the first book, when you read on in the Oz series (14 books total) things tend to even out in respect to gender. The Scarecrow comes to be considered the wisest person in Oz, the Tin Man becomes the kind ruler of the Winkies, the Lion finds his courage and delivers some poignant words of wisdom in later books, even the Wizard stops being a fraud and under Glinda's guidance learns to become a practicing and competent wizard. Oz was certainly ahead of it's time for balancing the genders in an adventure story, just don't think anyone should be left with the impression that Baum always lifted females over males.